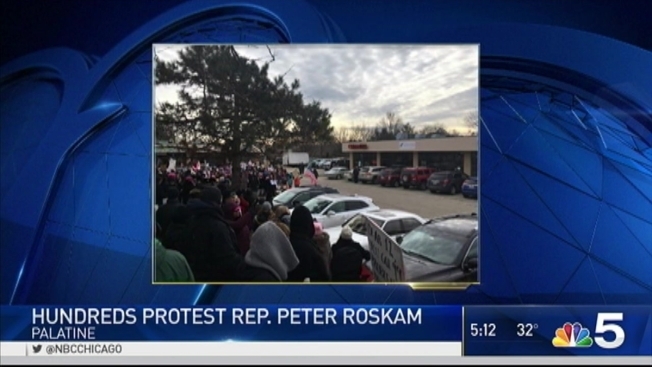 Hundreds of people gathered in suburban Palatine to protest Rep. Peter Roskam on Saturday morning. Roskam, a Republican who has represented the 6th Congressional District since 2007, was attending the Palatine Township Republican Organization's monthly meeting at the organization's headquarters at 9 a.m. Initially open to the public, the meeting was later closed because of high demand, according to the group's chairman Aaron Del Mar, who said that the office fits 100 people, and more than 110 members attended. "He came in and gave us a synopsis of what this Congress is going to be focusing on and their priorities, and the rest was Q and A," Del Mar said of Roskam's participation in the meeting. Outside, demonstrators carried signs with messages on a variety of issues, with many expressing frustration at being unable to meet with Roskam, whose district includes portions of Cook, DuPage, Lake, Kane and McHenry counties. The protest came just days after members of Roskam's staff reportedly canceled a meeting with a group of 16 constituents upon realizing a reporter was present, according to the Chicago Tribune. Roskam later told the Tribune that the meeting, over concerns about a possible repeal of the Affordable Care Act, would be rescheduled without the reporter. "We do not permit members of the media to sit in on constituent meetings with staff," Roskam spokesperson David Pasch said via email on Saturday. "We have reached out to find a new time and look forward to sitting down with this group in the near future." Saturday's demonstration was coordinated by several organizations including the 6th District of Illinois - Holding Peter Roskam Accountable, and Action 6th District Illinois, both of which have several hundred members in Facebook groups. "His time is reserved for donors and corporate interests," said Carolynne Funk, one of the protest organizers, adding that Saturday's demonstration was to express concerns that Roskam is "not listening or engaging with his constituents." "We can no longer accept that he refuses to hold town hall meetings or meet with constituents who may disagree with his voting record," Funk said. "The stakes are now too high to tolerate being shut out of the democratic process any longer." Videos posted on social media showed protesters chanting things like "Talk to us" and "Hey Peter, we vote," as well as "Shame on you" as Roskam appeared to leave the meeting. One person was arrested in connection with the protest, according to Palatine police, who said it "was a very minor thing," but further information on the incident and any charges filed would not be available until Monday. In a statement, Roskam's spokesperson held the Democratic Congressional Campaign Committee responsible for the demonstration and disputed claims that he was not accessible to his constituents. "Peter is no stranger to the DCCC," Pasch said. "These national groups are free to come into our community and exercise their first amendment rights, but it's not going to keep him from meeting with constituents. He's focused on representing the people of the western and northwestern suburbs in Washington, D.C., not the other way around." Roskam "maintains one of the busiest district schedules of any Member of Congress," Pasch added, detailing highlights of his schedule over the past year. In 2016, according to Pasch, Roskam held 74 meetings at his district office, 30 roundtable discussions and 11 "tele-town halls." He also made 21 visits to schools and 107 visits to local businesses, hospitals and non-profits, Pasch said, as well as 113 speaking engagements and 147 other meetings, events and award presentations.